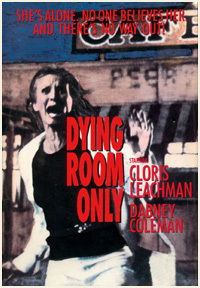 Originally aired on September 18, 1973, Dying Room Only is a prototypical example of the ABC Movie of the Week so common during the period. Expertly paced, and well acted by lead Cloris Leachman, it's the type of vehicle that had viewers on the edge of their sofas and beds. Leachman heads a small (but exemplary) cast that included Dabney Coleman and Ned Beatty. The film is bolstered by a suspenseful teleplay from legendary Richard Matheson (based on his short story) and was a memorable thrill in many ways for viewers lucky enough to catch it on the tube in September '73. Tight direction from Philip Leacock and a terribly unique score by Charles Fox (Wonder Woman, The Love Boat) only enhance the bygone effectiveness of Dying Room Only and such gems like it. Bob Mitchell (Dabney Coleman) and his wife Jean (Cloris Leachman) are driving through the hot Arizona desert on their way home to Los Angeles. A detour has taken them 100 miles out of the way down a deserted road...because Jean insisted on taking photographs of a particular area to take back to their daughter. Bob is irritated by the delay in getting home - and after throwing a few jabs at Jean, the two stop at a roadside cafe/inn called the Arroyo Motel. It's a rundown claptrap and aside from the cook Jim Cutler (Ross Martin) and one customer named Tom (Ned Beatty), the place is empty. But the two travelers are hungry and the diner will do for now. To their surprise, both Jim and Tom are hostile and downright rude to them. The situation makes Jean uncomfortable. She tries to call home using the payphone but the line is busy. Jean gets up to go to the restroom and wash her face. When she returns, Bob is nowhere to be found. Perhaps he went to use the bathroom himself, she thinks. Their station wagon is still parked outside. Minutes pass and still no Bob. A tight-lipped Jim and Tom are extremely unhelpful, telling Jean that Bob probably just abandoned her. At Jean's request, Tom agrees to go into the men's room to see if her husband is alright. The seconds seem to take forever, but when he emerges, he tells Jean that Bob isn't there. Jean goes next door to the motel, where a woman named Vi (Louise Latham) works the front desk. She's also vaguely unfriendly and of no help. Unbeknownst to Jean, hurried calls are being made between Vi and Jim in the diner. Starting to worry even more, Jean tries to go inside the cafe men's room but it is locked. Jim finally opens the door when Jean threatens to call the police. Bob isn't around, naturally, but she does notice a second door...that may lead to another exit. The cook refuses to open it for her and Jean contacts the police. Meanwhile, someone drives off in the Mitchell station wagon and Jean runs out screaming for her husband. Night has now fallen and the Sheriff (Dana Elcar) arrives. As Jean tells her story, the officer looks bewildered. It all sounds so far-fetched. In fact, the door to the men's room isn't locked. The other door inside leads to an old storage shed...but still no trace of Bob. An APB is put out for the car and Jean plans on staying in the motel until further notice from the Sheriff. Neither Jim nor Vi are particularly happy to have her hang around. And despite Jean's plea for him to check out the other rooms, the Sheriff doesn't see any cause to do so. Later, Vi refuses to place a call to the FBI and Jean is unable reach her home in Los Angeles. Jean confronts Vi and tells her, "I don't know what's going on here, but I will find out!" The now frantic wife has no choice but to search around the motel by herself. She enters the shed behind the men's room. Peeking through the keyhole into the restroom beyond, she spies Tom entering on the other side...and immediately she notices a light bulb illuminate next to her. That's how they did it, she thinks. A third man must have been hiding in the shed when Bob entered the restroom...the lighted bulb must have served as an alert to the kidnapper that it was time to nab her husband...leaving Tom and Jim free to distract her as they carried off their plan! At that moment, Jean is relieved to see the family vehicle pull up. But instead of Bob stepping out, she is frightened by a tall, hulking character with a limp (played by Ron Feinberg). She runs into some underbrush and when Tom comes near her, she whacks him with a stick. And then at last, she catches a glimpse of her husband...bound and gagged, he's being shuffled into the station wagon and driven away. The Sheriff returns and this time he believes her story. The two drive through the desert towards an abandoned pump station, while Tom follows behind. The Sheriff tells her that the man with the limp is named Lou McDermott and that he recently jumped parole. Oh...and there have been other mysterious disappearances, a fact he neglected to tell Jean earlier. At the gas station, the Sheriff shoots and kills Lou and then the officer himself is snuffed out by Tom. Jean grabs the steering wheel of the police vehicle and tries to run Tom down - but she's caught. Both Bob and Jean are taken back to the motel and are kept in Jim's truck until the three perpetrators can figure out what to do. Vi turns on Jim and shoots him. As she comes towards the truck with gun in hand, Jean lights a flare and blinds Vi. She then grabs the revolver and holds both Vi and Jim at bay until the authorities arrive. Now safe, Jean places a tearful call to her children and tells her daughter they had a "fine time" on their trip. They're coming home, she says...fast as they can. Kudos to all involved for Dying Room Only...but the film firmly belongs to Cloris Leachman. The former Miss Chicago of 1946 (and Miss America runner-up) had become a household name with her role as Phyllis on the classic Mary Tyler Moore Show and its subsequent spin-off. Additionally, Leachman had won a Best Supporting Actress Oscar for her work in 1971's The Last Picture Show. Leachman's nuanced performance in Dying Room proves how adept she has been in both drama and comedy - and serves as ample proof why she is one of the most enduring and prolific actresses in the business. Coincidentally, Leachman's Mary co-star and onscreen nemesis Valerie Harper ("that dumb, awful Rhoda") would prove her survival skills equally well with the excellent desert thriller Night Terror in 1977.